Go Healthy Go Royal Jelly 1000mg with 10 HDA 12mg 180 Capsules boosts energy, stamina, immune health and vitality. Royal jelly is known as a rich source of highly concentrated nutrients such as B vitamins, complete proteins, lipids and carbohydrates. In the hive, royal jelly is fed to the Queen Bee, increasing her growth rate and extending her life span. It supports energy, stamina, immune health and vitality. 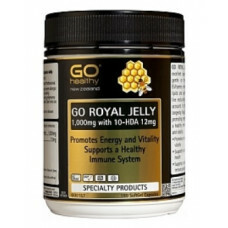 Royal jelly may cause severe allergic reactions and in rare cases fatalities, especially in asthma and allergy sufferers. It is not suitable for children. Do not use if cap seal is broken. No artifical flavours, sweeteners,preservatives or colours used in this product. May be refrigerated to maximise feshness. Refrigerate after opening. Royal jelly is a rich source of highly concentrated nutrients including B vitamins, complete prot..
PETER AND JOHN ROYAL JELLY is a rich source of nutrients including vitamins A, B-complex, C, D and E..